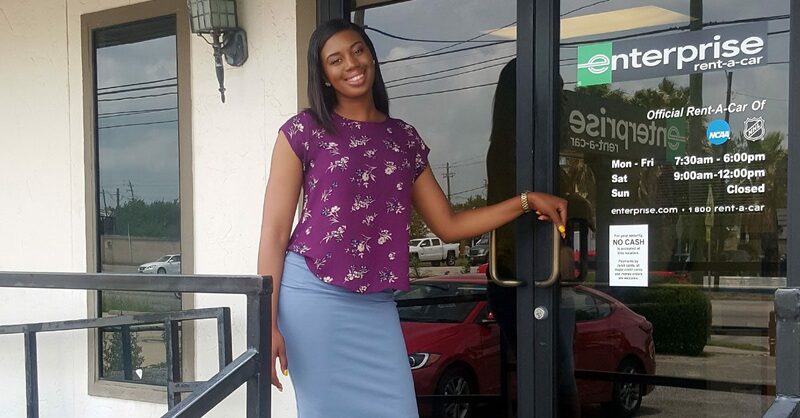 Latisha joined the Enterprise Intern program in May 2017, and is now a Management Assistant. Keep reading to find out more about how Latisha’s drive and entrepreneurial spirit have led to her taking on an important role as a leader in the short time that she has been with the company. I got started at Enterprise last year while I was completing my degree at Texas Southern University, majoring in business management. I became a full-time intern last summer at a downtown Houston branch. Once I graduated, I became a Management Trainee. I knew I wanted to manage a business but I wasn’t sure what type of business. Once I started at Enterprise, I knew I would be able to build my career quickly. My goal now is to be promoted to assistant manager at my current branch. I’m looking forward to teaching others, recruiting more employees and creating teams that will go on to develop and grow the business. Don’t be too hard on yourself – make sure you stop to celebrate your wins. Wins I’m currently celebrating include having been invited to our team’s outing for top performers every month, forming a relationship with a local body shop, and selling six cars. How fast it’s progressing. I didn’t realize how quickly the internship would lead to a Management Trainee position. I appreciate the fact that doing well when I started meant I could move up quickly. This is the first company where I got to see first-hand that the company really does promote from within. Everyone I worked with at the branch where I started ended up getting promoted from that branch. Describe what an entrepreneurial spirit means to you and how you’ve used and nurtured that quality with Enterprise. To me, having an entrepreneurial spirit means pursuing several different avenues to achieve success. The sales aspect of the role was easy for me, but I hadn’t worked with body shops, dealerships and insurance agents so I had to grow in those areas. I wanted to open other avenues to reach success, so I worked to develop those skills quickly. Start out at Enterprise – you’ll learn so much. I assumed I would learn about sales, but I’ve learned so much more. What you learn will help you at Enterprise and in other aspects of your life.